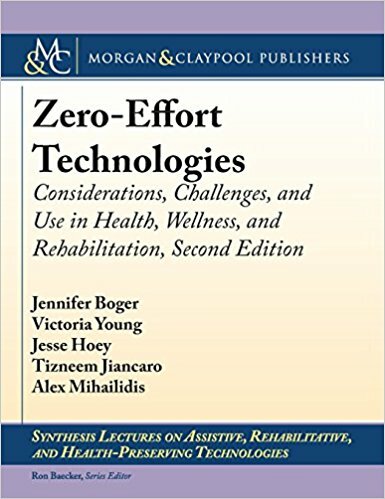 This book introduces zero-effort technologies (ZETs), an emerging class of technologies that require little or no effort from the people who use them. ZETs use advanced computing techniques, such as computer vision, sensor fusion, decision-making and planning, machine learning, and the Internet of Things to autonomously perform the collection, analysis, and application of data about the user and/or his/her context. 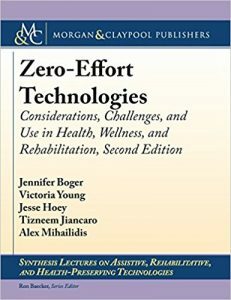 This book begins with an overview of ZETs, then presents concepts related to their development, including pervasive intelligent technologies and environments, design principles, and considerations regarding use. The book discusses select examples of the latest in ZET development before concluding with thoughts regarding future directions of the field. Department of Occupational Science & Occupational Therapy / Institute of Biomaterials & Biomedical Engineering, University of Toronto, University Health Network–Toronto Rehabilitation Institute.